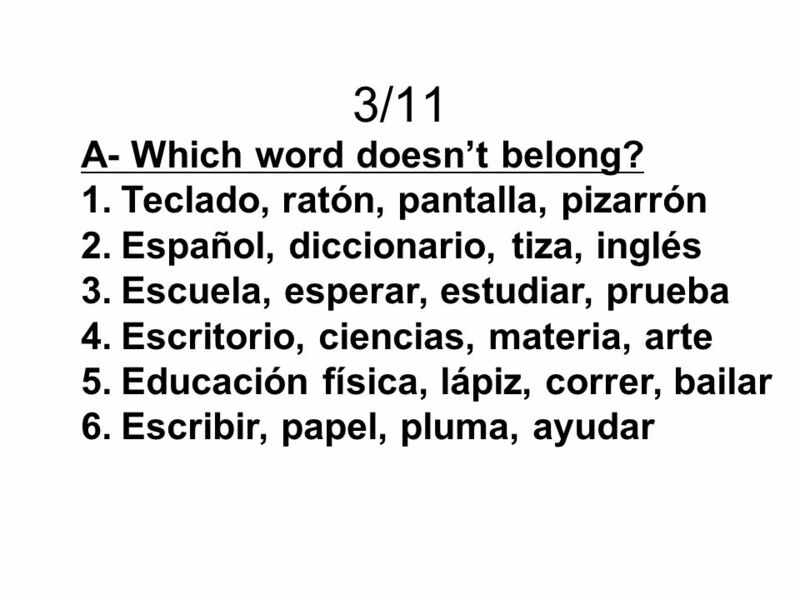 2/7 A- Answer these questions using the given person. 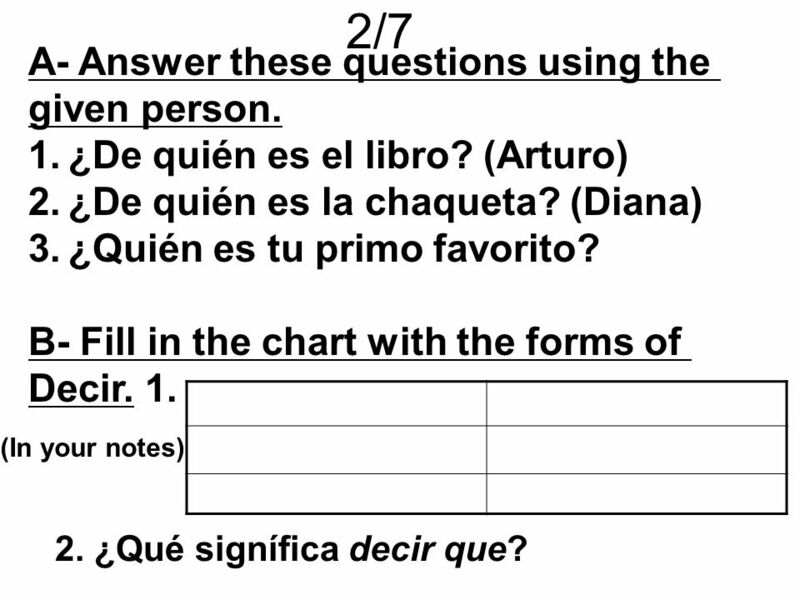 1 2/7 A- Answer these questions using the given person. ¿De quién es el libro? (Arturo) ¿De quién es la chaqueta? (Diana) ¿Quién es tu primo favorito? B- Fill in the chart with the forms of Decir. 1. (In your notes) 2. ¿Qué signífica decir que? 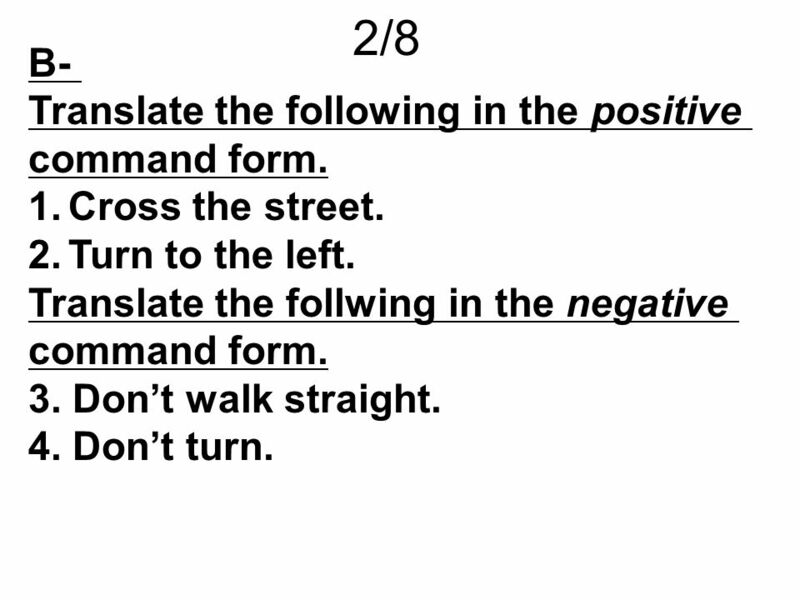 2 2/8 B- Translate the following in the positive command form. Cross the street. Turn to the left. Translate the follwing in the negative 3. Don’t walk straight. 4. Don’t turn. 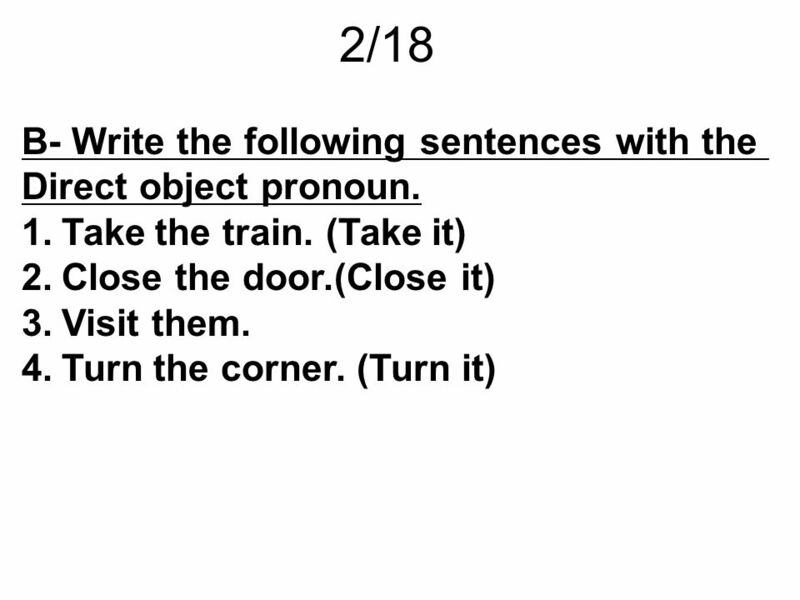 4 2/18 B- Write the following sentences with the Direct object pronoun. 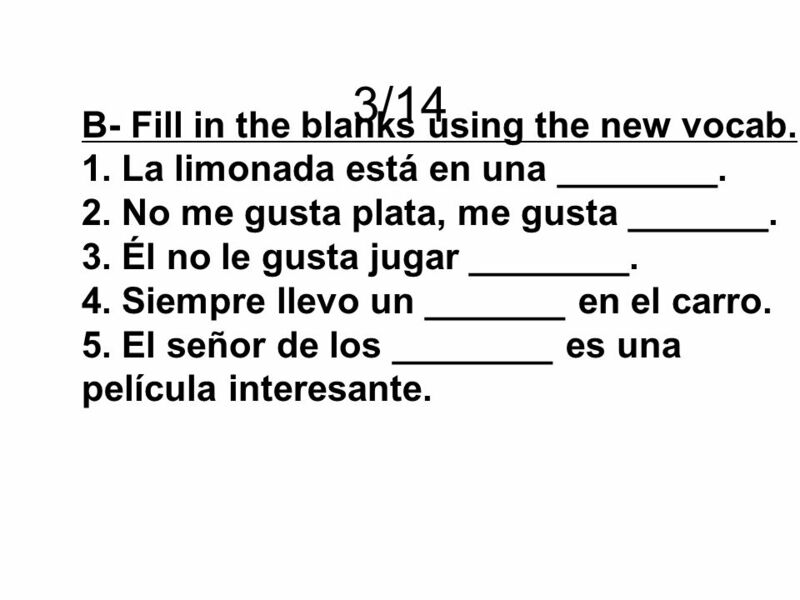 6 3/14 B- Fill in the blanks using the new vocab. La limonada está en una ________. No me gusta plata, me gusta _______. Él no le gusta jugar ________. Siempre llevo un _______ en el carro. El señor de los ________ es una película interesante. 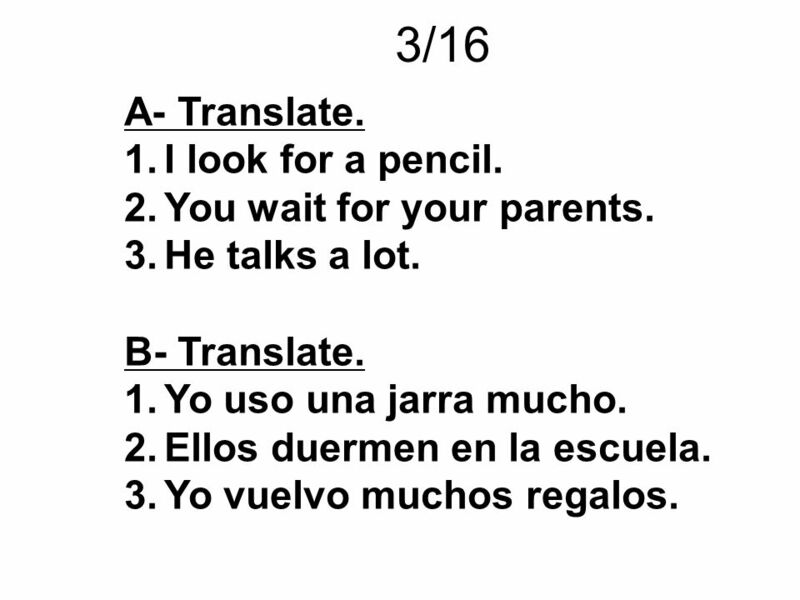 7 3/16 A- Translate. I look for a pencil. You wait for your parents. He talks a lot. 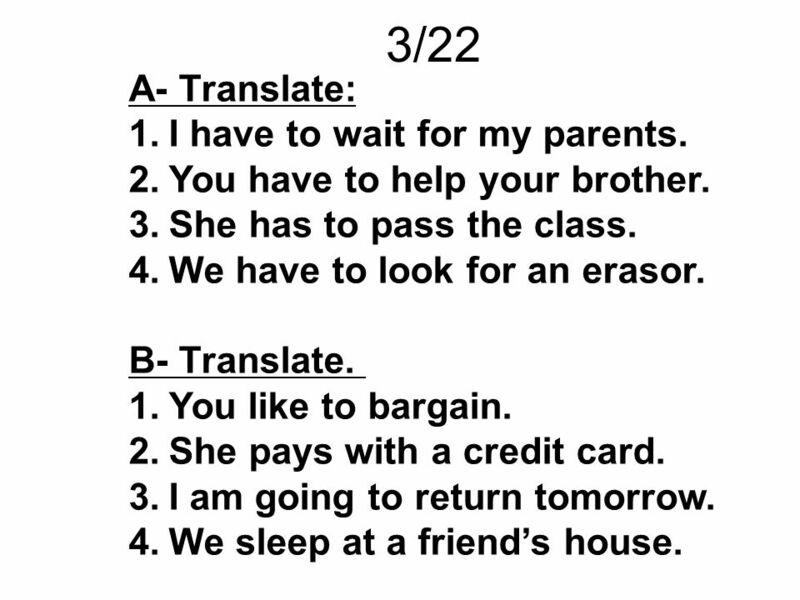 B- Translate. Yo uso una jarra mucho. Ellos duermen en la escuela. Yo vuelvo muchos regalos. 8 3/17 A- What is an infinitive? 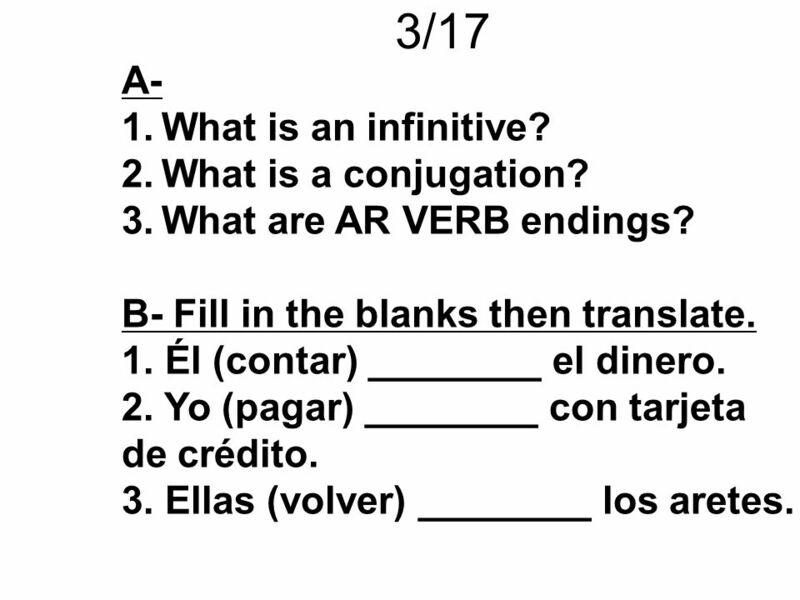 What is a conjugation? What are AR VERB endings? B- Fill in the blanks then translate. 1. Él (contar) ________ el dinero. 2. Yo (pagar) ________ con tarjeta de crédito. 3. Ellas (volver) ________ los aretes. 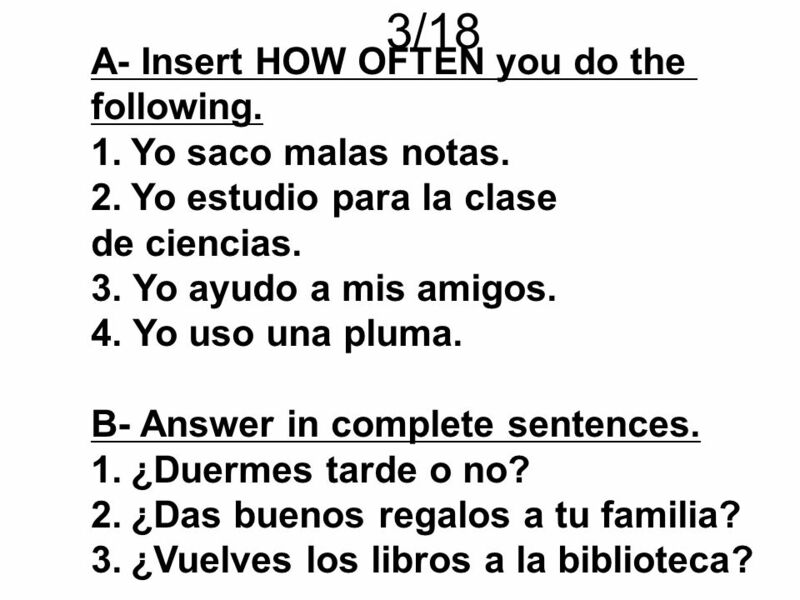 9 3/18 A- Insert HOW OFTEN you do the following. Yo saco malas notas. Yo estudio para la clase de ciencias. 3. Yo ayudo a mis amigos. 4. Yo uso una pluma. B- Answer in complete sentences. ¿Duermes tarde o no? ¿Das buenos regalos a tu familia? ¿Vuelves los libros a la biblioteca? 11 3/22 A- Translate: I have to wait for my parents. You have to help your brother. She has to pass the class. We have to look for an erasor. B- Translate. You like to bargain. She pays with a credit card. I am going to return tomorrow. We sleep at a friend’s house. 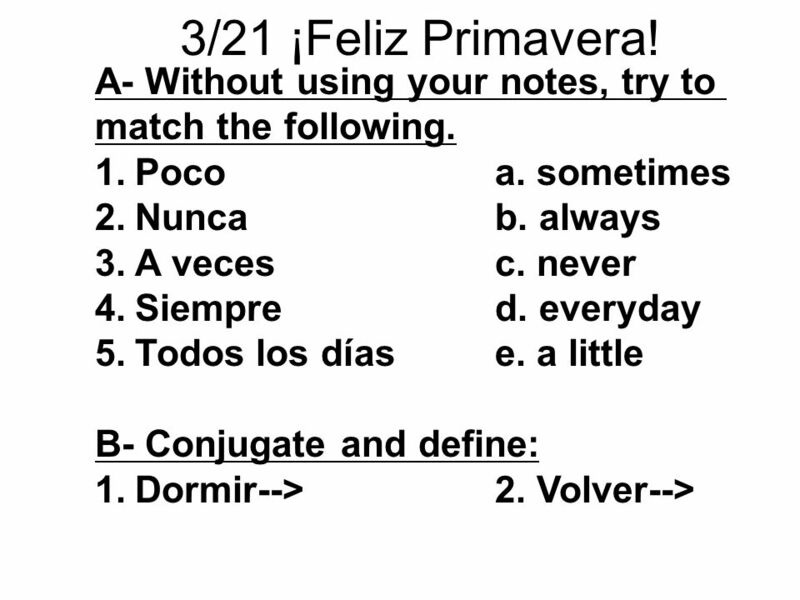 Descargar ppt "2/7 A- Answer these questions using the given person." Cr-cr cráter Mira la luna con este telescopio. ¿Puedes ver sus cráteres? Look at the moon with this telescope. Can you see its craters? DIRECT OBJECT PRONOUNS Pronombres de objeto directo. 1 COMMANDS and PRONOUNS 2 Commands and Pronouns We still conjugate the command like normal. We have to see whether the command is POSITIVE or NEGATIVE.